Patty Ann Hustead was born __ 1957 in Lubbock Co., TX, daughter of Floyd Dudley Hustead and Melba Lois Newton. Mary Ann Culpepper, Female, born __ 1976 in Potter Co., Texas, child of Joe Clifton Culpepper and Patty Ann Hustead. Jarrett Clifton Culpepper, Male, born __ 1980 in Potter Co., Texas, child of Joe Clifton Culpepper and Patty Ann Hustead. Dorothy Irene Culpepper, 74, passed away on November 19, 2006 in Longview, Texas following a courageous battle with cancer. Services for Dorothy will be 2 PM Saturday, November 25, 2006 in the Chapel of Rader Funeral Home, 1617 Judson Road, with the Reverend Roy Broadbrooks officiating. Interment will follow at the Hallsville Cemetery. The family will receive friends from 5-7 p.m. on Friday, November 24, 2006 at the funeral home. Dorothy was born December 20, 1931, in Marshall, Texas; the daughter of A. W. and Fannie Cisco. 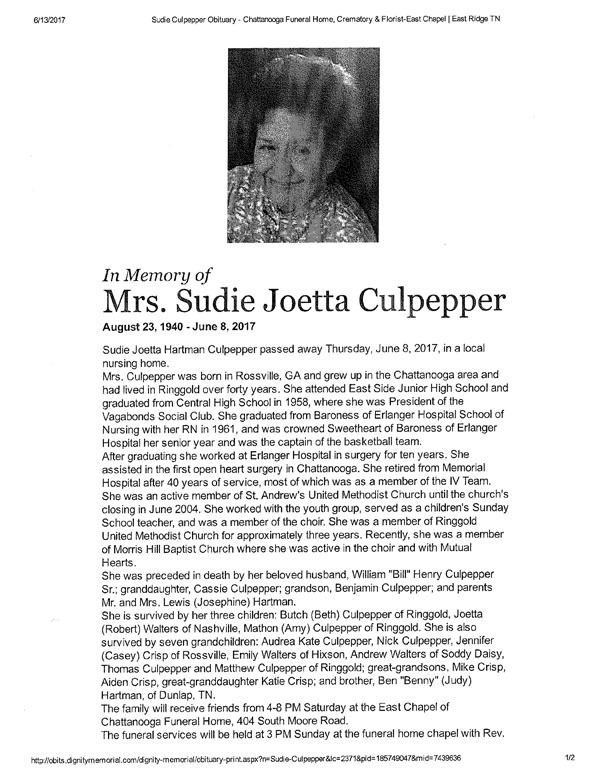 In 1950 she married Jerry Eugene “Gene” Culpepper in Gadsden, Alabama. The couple settled in East Texas and both retired from Made-Rite Bottling Company in Longview after lengthy employment with the company. Dorothy especially enjoyed spending time with her family and attending school activities and sporting events of her children and grandchildren throughout the years. She was preceded in death by her husband, Gene Culpepper; a granddaughter, Chasity Culpepper; and seven brothers and sisters, Alvin Davis, O.H. Cisco, Doyle Cisco, Frances Cisco Ford, Elizabeth McGee, Louise Snellings and Venita Hill . She is survived by her two sons and daughter, and their spouses, Sammy and Linda Culpepper of Longview; Jerry and Becky Culpepper of Hallsville; and Judy and Ken Hartley of White Oak; grandchildren, Jerry “Bubba” Culpepper and Chelsey Culpepper of Hallsville and Jeannie Frazier of Arp; great-granddaughter, Madison Foster of Hallsville; brothers, Arlie Davis of Killeen and Wayne Cisco of Marshall; and numerous nieces and nephews. Sammie Eugene Culpepper, Male, born __ 1952 in Harrison Co., Texas, child of Jerry Eugene Culpepper and Dorothy Irene Cisco. Dorothy Irene Cisco, born __ 1931 in Harrison Co., TX, daughter of A. W. Cisco and Fannie Wilson. Jerry E. Culpepper and Dorothy I. Cisco married 8 Jul 1950 in Etowah Co., AL. E-mail written 2003 - 2008 to Lew Griffin from Sammy Eugene Culpepper (#47245), e-mail address. Judy Kay Culpepper, Female, born __ 1955 in Harrison Co., Texas, child of Jerry Eugene Culpepper and Dorothy Irene Cisco. Jerry Keith Culpepper, Male, born __ 1958 in Harrison Co., Texas, child of Jerry Eugene Culpepper and Dorothy Irene Cisco. Sammie E Culpepper, 22, married Linda G Ross, 22, on 21 Jun 1975 in Gregg Co., TX. Chassity Anne Culpepper, Female, born __ 1981 in Gregg Co., Texas, child of Jerry Keith Culpepper and Rebecca Anne Mattern. Jerry Keith Culpepper Jr., Male, born __ 1985 in Gregg Co., Texas, child of Jerry Keith Culpepper and Rebecca Anne Mattern. Chelsey Raycene Culpepper, Female, born __ 1987 in Gregg Co., Texas, child of Jerry Keith Sen Culpepper and Rebecca Anne Mattern. Rebecca Anne Mattern, born __ 1961 in Harrison Co., TX, daughter of Buryl Benton Mattern Jr. and Felicia Anne Butler. Judy K Culpepper, 20, married Kenneth C Hartley, 21, on 31 May 1975 in Gregg Co., TX. Jeannie Marie Hartley, born __ 1979 in Gregg Co., TX, daughter of Kenneth Carey Hartley and Judy Kay Culpepper. Obituary for Jerry Eugene Culpepper, 28 Feb 2001. Martha A. Culpepper, Mother, F, 76, WD, AL AL AL. Perry Culpepper, Nephew, M, 25, S, TX TX TX , Farmer. Bonnie L. Culpepper, Dau, F, 4/12, S, TX TX TX. Winnie Clinton Culpepper, 8 Apr 1905 - 3 Mar 1932. Winnie Culpepper, Smith Co., Mar 3 1932, 13751. Michael Clinton Culpepper, Male, born __ 1950 in Smith Co., Texas, child of Marshall Culpepper and Louise Allen. Donna Louise Culpepper, Female, born __ 1951 in Shelby Co., Texas, child of Marshall Clinton Culpepper and Virginia Louise Allen. David Ken Culpepper, Male, born __ 1957 in Smith Co., Texas, child of Marshall Clinton Culpepper and Virginia Louise Allen. Tammye Ellen Steed, born 3 Jul 1962 in Smith Co., TX, daughter of Craig Neville Steed and Bonnie Lee Culpepper. Angela Jo Steed, born 16 Mar 1958 in Smith Co., TX, daughter of Craig N Steed and Bonnie Culpepper. Leon M Culpepper, Male, died 17 May 1975 in Smith Co., TX. Bonnie L Culpepper, 48, married William P Montgomery, 45, on 15 Nov 1977 in Dallas Co., TX. Dixon J. Culpepper, Head, M, 30, M, md@26, TX TX TX, Estimater-Power Co.
Nell Culpepper, Wife, F, 29, M, md@25, TX IA TX, Ledger Clerk-Power Co.
Smith Co., TX: Alexander Culpepper and Mary Butler, 4 May 1864. Mary Delaney, G-Dau, F, 7, S, TX TX TX. "Pedigree Resource File," database, FamilySearch (http://familysearch.org/pal:/MM9.2.1/39VN-71W : accessed 2014-09-17), entry for Vister /Culpepper/. E-mail written Sep 2014 to Lew Griffin from Linda Dickey Crnkovic, e-mail address. Chub Collier, Illegible, M, 25, S, Ok MO TX, Laborer-Gravel Pit. Isabella F. Culpepper, Mother-in-Law, F, 75, Wid, AL VA GA.
E-mail written Sep 2008 to Lew Griffin from Tanyua Davis, e-mail address. Ina Lee Mars, S-Dau, F, 16, S, TX GA AL. Viola Sanders, Servant, F, Wh, 30, Div, TX/TX/TX, Cook/Private family.